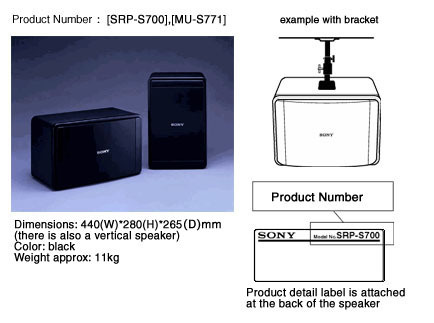 Sony has become concerned about the possibility of Sony's professional use speakers, [SRP-S700],[MU-S771] (manufactured between October '87 and December'93),becoming detached from the ceiling due to the screws,[MU-533S/MU-533M/MU-533L],[MU-753S/MU-753M/MU-753L], not being tightly closed. Sony asks all customers who have purchased these speaker systems to contact the following telephone number regardless of how the speakers have been installed. Sony will fix the screws without charge for all customers that have attached the speaker system to ceiling, and will check the installation for customers that have the speaker system attached to locations other than the ceiling. Sony sincerely regrets the inconvenience this has caused customers and appreciates their understanding and cooperation.